I began training with Cyrus about 2 months ago. I have trained on and off for over 10 years with various trainers and using books and videos. Cyrus is one of the best educated and well rounded instructors I have met. He provides motivation and unlimited opportunity to challenge yourself. Kettlebells are remarkable because they combine strength training, aerobic training, and core training that translate to most any situation in daily living and in sports. You will work hard, but you will gain strength and lose pounds. Its addictive! Intense and awesome training for the entire body. Cyrus Peterson is extremely knowledgable and committed to helping you achieve your goals. I find the kettlebell workout challenging, but refreshing and saw results from day 1. No kidding. I highly recommend Advanced Training Concepts to anyone desiring a training program that will definitely yield high results and who is not afraid of hard work and committed to change. I train on a one-to-one basis w/Cyrus four times weekly now. I will continue working w/ him indefinitely. Cyrus is an expert in this field. I started Kettlebell Training about 4 months ago with Cyrus Peterson. Cyrus is a great trainer & coach. He keeps you motivated and he challenges you to the next level. Even when you try to give up on yourself, he encourages you to keep going. One thing is for certain, training at ATC is definitely not boring!! Whether you are an experienced athlete or new at exercising, you will feel the difference & see the results with Advanced Training Concepts. Don’t be afraid to give it a try. This has been the most rewarding decision I've ever made. It's an investment in my health, and the return has been much greater than I ever expected. Overall, I've been training at ATC for almost 3 years now. Through kettlebell instruction, we've been able to take it to another level and I'm completely hooked. I wouldn't want to spend my training dollars anywhere else. I've lost over 40 pounds, gained a lot of muscle, developed healthy eating habits, and significantly reduced my cholesterol and blood pressure levels. I'm confident that none of this would be possible without the instruction and guidance I have recieved, and I would highly recommend it! I am amazed at the progress I have made in only a year of doing the Kettlebell classes. 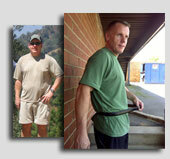 Advanced Training Concepts works with each of the members of class, to make sure that form is correct. I really am glad I have stuck with this. At almost 40, I am in the best shape of my life. I am hooked on KettleBells! Kettlebell training @ Advanced Training Concepts has yielded me a lot of benefits: •A more toned body! •nutritional knowledge-healthier eating •Loss in weight and inches! •more confidence! •strength-physical and mental •pushes me to levels I would never have known I could accomplish. What I appreciate is knowing that Cyrus continues to self educate, certified through quality certifications, and has a true passion for assisting you in reaching and achieving your goals as long as you are commited to working hard and being disciplined. I was looking for something to change up my workout and boy did I find it. I have heard of kettlebell workouts before but just thought they were another fad. Well I was truly mistaken, they are serious business. And one heck of a workout! This is just right for the for the person that gets bored with the same routine. TRY IT! Cyrus keeps you motivatied and encourages you to keep pushing harder. Kettlebell Lifting is a great for all athletes or just an "average joe" looking to get back in shape. Very challenging but fun at the same time. Before you know it class is over! Cyrus does a great job of making sure you are using proper technique and the classes are smaller so you are getting more one on one attention. Before starting the Program with Advance Training Concepts, I was a total sugar junky. After turning 50, I found myself overweight by 25 pounds, looking dumpy, and feeling tired all the time. I had to do something or I was going to go down a road I did not want to go down. I started dieting in February, exercising 4x's a week, and by May, I had gone from a size 8 to a size 6. I lost 22 pounds. I feel great, have so much energy, and best of all a size 6 looks great on me. I can not thank Advance Training Concepts and Cyrus for getting me back on track. Cyrus customized a diet for me that was not only easy to do but tasted good. I am currently working out with Cyrus in his Kettlebell liftingprogram. It is great when I am complimented by friends and co-workers on how toned my arms, core, and legs are. It makes your day! Do something good for yourself today. You will not regret it! Choosing to work with Cyrus at ATC was a great decision for me. I benefited from the clear and concise instructions and uncompromising standards in so many ways. Due to his focus on standards and technique, I reached a high level of physical fitness and will always have a gold standard to hold myself to, which is critical. Since having left ATC after every workout I ask myself the question “How does that compare to one of Cyrus’s workouts?”. Cyrus is constantly elevating his mastery and passing the knowledge down to you . He has also built a strong community based on shared values of health and fitness. ATC is by far the best place I have ever trained.